Tamarind is soaked in water and the extracted juice is cooked in oil and spices till thick. Black chickpeas is also boiled and added to the tamarind extract. 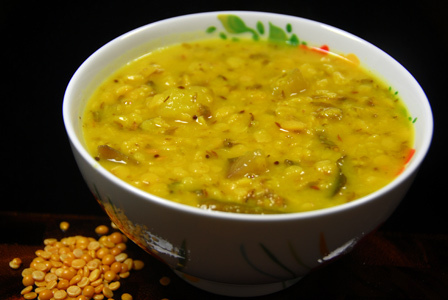 A spoonful of pulihora mix can be mixed with around a cup of steamed rice and can be served immediately. Makes: around 1 Cup of Pulihora Mix. Soak the black chickpeas in water for around 6 hours. Pressure cook soaked black chickpeas in a cup of water for 3 whistles. Strain the cooked black chickpeas and keep aside. 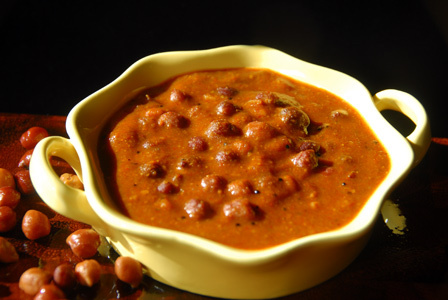 Toast the chana dal in a pan until light golden in color and grind the chana dal into fine powder using a spice grinder. Soak tamarind in 1 1/2 cups of warm water and extract all the juice discarding the veins. When mustard seeds start spluttering, add tamarind extract, jaggery, ground chana dal powder, cooked black chickpeas, red chili powder, turmeric powder and salt. Boil the mixture on low flame till the oil separates and it thickens (around 15 minutes). 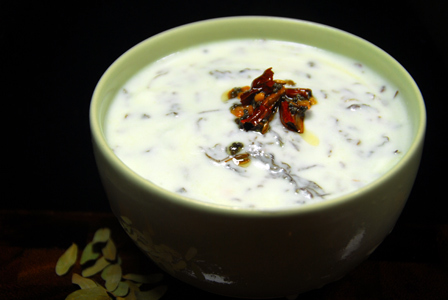 Remove the pulihora mix onto a bowl and cool it to room temperature before refrigerating. 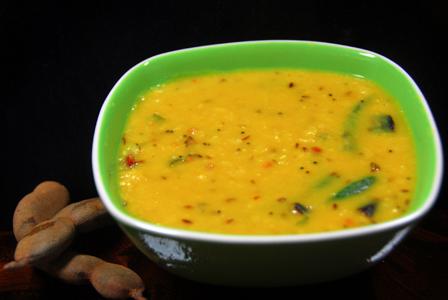 Mix couple of tablespoons of pulihora mix in steamed rice and serve immediately. Notes: Make sure to adjust the tamarind based on the tartness. Suggestions: You can microwave the tamarind soaked in water for around 30 seconds to soften it a bit to ease the extraction. Variations: You can also add finely chopped green chiles while boiling tamarind extract for extra spice. Bottle gourd is peeled and chopped into small chunks. They are then boiled in water or pressure cooked till just soft. 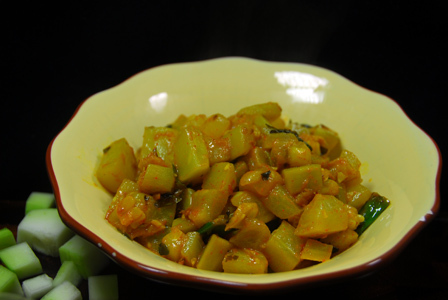 Cooked bottle gourd is finished in spices and ginger and tamarind extract. Serve bottle gourd tamarind curry with steamed rice or with roti. Makes: around 3 Servings of Bottle Gourd Tamarind Curry. Peel and thoroughly mash the fresh ginger. Strain the cooked bottle gourd and keep aside. Soak tamarind in few tablespoons of water. Microwave for 30 seconds. Squeeze the thick pulp discarding the veins. Fry briefly, stir bottle gourd pieces, tamarind extract, red chili powder, turmeric powder and salt. Serve bottle gourd tamarind curry with steamed rice or with roti. Notes: Make sure not to overcook the bottle gourd pieces. Suggestions: If bottle gourd is not cooked well, put the curry back on heat and cook covered on low flame till done. Variations: Check other recipes with bottle gourd here. Other Names: Bottle Gourd Tamarind Curry, Anapakaya Chintapandu Kura.